Wow, fantastic post, thanks so much for collecting and publishing the data with your analysis! Just a couple of minor things - the 'Bounce Rates on PPC Campaigns' labels might be the wrong way around? Also, it's interesting to see whether the home page is the top entrance page or not, but I like to compare say entrances for *all* product pages, or blog posts, or articles or whatever to home page entrances, and then you get an even better look at the importance of other types of pages vs the single home page, but I understand that would have been a difficult thing to survey. Thanks for the feedback. I fixed the graph. Let me see if I have the data to provide the information that you are looking for. Great to have some publicly available figures like these. Thank you so much for compiling them. I'm not sure there ever really was a time when the home page was the starting point for all visits, though. I used to track traffic back when Analog was the first tool of choice and can remember having to make this point to site owners back in 94-95. Even then the effect of deep links, as well as the likes of Lycos and Alta Vista, was quite marked. I think Luke's right to suggest combining all the product pages (or blog posts, or news items, articles etc) together and then considering how they rank as landing pages. And how they bounce. On the e-commerce sites I know, the product pages combined are the top point of entry and also have higher bounce rates. They tend to be used by new visitors as part of their research process when they are pogoing back wards and forwards from search engine results pages. It would be great to extend the survey if possible, or include this if you repeat the exercise at some point. But this is still great. Great study thanks so much for sharing the results! I manage the analytics for a fair number of lead generation sites. The sites are real estate specific sites with search being among the primary functionality on site. For this group of sites I find the opposite of your findings re: paid search bounce vs organic bounce. Paid searchers coming to the sites I manage are consuming 10 to 20 times the typical viewer. My guess is this has to do with the search task orientation of the visitors for this industry. Again, great work and thanks for sharing it! I'm teaching a class tonight through Biznik Seattle on how to get visitors off your home page and deeper into the site. I was just looking for bounce stats yesterday. I found some, but this is more in-depth. Thanks for your great timing. Amazing content! Thanks so much for selflessly sharing. 1. Which geo did you target for this study - USA, UK, EU, APAC? 2. What was the research methodology employed for this study & what was the sample size? That's incredibly useful information; thanks. I was wondering where we fell in relation to the same category, and you answered all of my questions! This has been so helpful. I had to find out information on this topic and had no idea where to look. I am so thankful that you did this survey and shared your findings. Great post, I was looking for data on bounce rate. Thanks for putting this together. Great article. I do also have proof that PPC campaigns have a higher bounce rate than SEO campaigns. Hey Anil, great post! I have always wondered how my sites compare to others. Having the site categories broken-out like that really helps put things in perspective. It would be easy to see this information, see that your site is around average, and then be satisfied with that. 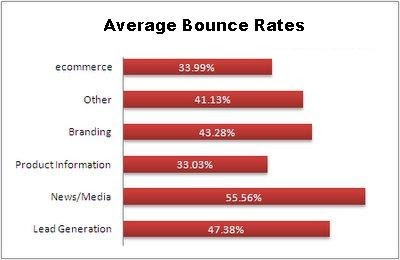 Even if your site is within average ranges, it doesn't mean you should stop optimizing for a lower bounce... I know I won't! Good article. Something interesting to analyze would be bounce rate by specific areas, like travel guides. "Paid search has higher bounce rate than organic search, unless you have a news/media site." Through targeting of overly generic keywords and messaging which might lead to the tendency to drive the higher bounce rate. Improper targeting of landing pages with the keyword intent which ultimately leads to the higher bounce rate and to add on the increase in cost per acquisition. Fascinating post - it has set me off comapring my own bounce rates against some of the data here !. Is there any further data about country of origin of the visitor i.e. does where you come from affect bounce rates ? Thank you for putting the information up in a straight forward way. This is like the 5th site i've been to and none of the others gave a straight answer as to what an average bounce rate was. I think I'm going to go to several of your pages to help with yours. thanks. I thought my bounce rate of 90% was excessive, now I know it is! This article was very helpful. Our bounce rate is around 37% I think still some room for improvement. But this helps....it stinks knowing so many people show interest and leave the page. Thats like walking into a store and walking out with nothing.